Home to the oldest and largest pool in the city, this park along the East River also boasts tennis courts, a track, walking trails, basketball courts and multiple playgrounds. Astoria Park, home of the landmarked Pool where Olympic Trials were held in the 30s features an expansive view of Manhattan and both the Triborough and Hellgate Bridges. There is always a full range of concerts and activities during the Summer months, and the large, well-treed park features a Bocce Court, Skateboard Park, Running Track with Parcourse, and bicycle trail. Great pool, Nice tennis courts, real nice outdoor track. This park really sets itself apart from the rest of NYC's green spaces. 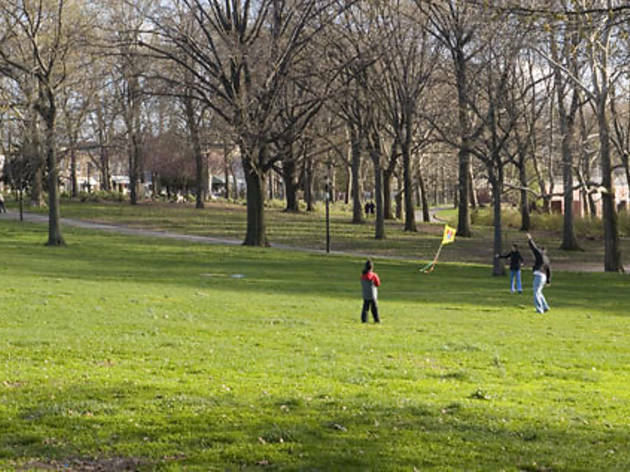 Seated on a hill with sloping pathways and tons of grass for outdoor picnics, the park is right on the East River, and a Greenway bike path easily brings you to the park from Manhattan or Brooklyn. Astoria park is practically my back yard, and I couldn't be happier about it. The park itself is so nice, and the association keeps it clean, and fun with plenty of activities for everyone! 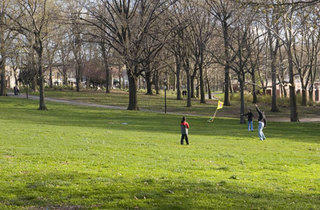 Located a bit north of the Triborough Bridge, Astoria Park is a hilly park that is great for a walk, bike, or run. There is a quarter mile track under the bridge that was redone a few years ago. The park has a playground and some basketball hoops.In the center is the large public swimming pool with accompanying high diving platforms. Unfortunately, the high diving platforms have been closed for years and will never re-open to the public (Boo!). I have heard that they may make that area a performance space. The park hosts music during the summer on the lawn and is a great place to catch 4th of July fireworks the week before 4th of July. In winter, its decent for sled riding. The views of Manhattan and Randalls Island are beautiful year round.